Home / Ideas & insights / Publications / Will India be the next hotspot for economic growth? Will India be the next hotspot for economic growth? 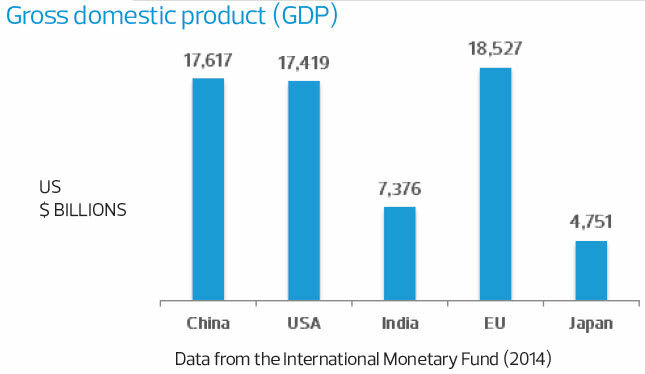 India is presently the world’s third-largest economy, with gross domestic product (GDP) of U.S. $7.4 trillion, in terms of purchasing power parity (PPP). The World Bank and International Monetary Fund (IMF) have projected India’s annual growth rate at 7.25 percent for 2015. In the midst of a global economic slowdown across geographies, this raises an interesting question—Will India be the next hotspot for economic growth? Apart from the size and sustained growth of the economy, India has the world’s largest democracy, which has a history of smooth shifts of power during the past six decades, and an independent judiciary. The new visionary political leadership, favorable demographics with more than 65 percent of the population below the age of 35 years, and a large, educated workforce, are what may be fueling the high growth expectations. The two distinguishing features of the Indian economy are its domestic-oriented economy (constituting about 75 percent), with limited reliance on exports, and a high savings ratio (30 percent). These factors certainly make India an interesting proposition for most businesses with an international perspective. Interestingly, the outlook for short-term growth is also good. 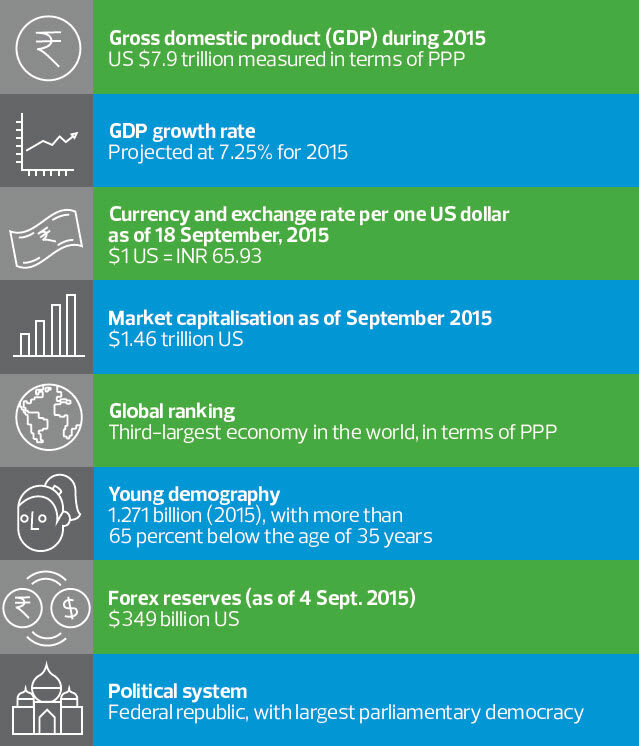 According to the IMF, the Indian economy is the “bright spot” in the global landscape. India’s economic growth will predominantly be driven by the information technology (IT) and business process outsourcing (BPO) industries, as well as infrastructure and banking, financial services and insurance sectors. The other major growth driver can be the Make in India initiative aimed at boosting India’s manufacturing competitiveness. India is known as the information technology hub for leading software companies of the world. Most of the IT giants, such as Microsoft, Oracle, SAP and Accenture, are using India as their principal development center, employing hundreds of thousands of engineers and other IT professionals. The exports of information technology services, business process outsourcing services and software services exceeded U.S. $100 billion in fiscal year 2014-15. With the Digital Revolution sweeping the world due to advancement in social, mobile, analytics and cloud technologies, India’s growth is expected to accelerate in the coming years. Currently, India has a remarkable 55 percent share in the global outsourcing market due to a tech-savvy workforce and a cost arbitrage two to three times that compared with the large advanced economies. According to A.T. Kearney’s Global Services Location Index 2014, a ranking of top 50 most attractive offshoring destinations, India has retained its position as the best outsourcing destination in the world. As per India Brand Equity Foundation, lower development cost, rising technology intensity and growing local demand for top-of-the-line, unique technology products have attracted research and development (R&D) investments from foreign companies in India. More than one-third of the top 1,000 global R&D spenders have centers in India. Historically, Indian manufacturing was not considered globally competitive due to the inflexible labor market, infrastructural constraints, high input costs and the economies of scale. The new political leadership has embarked upon a mega-initiative, called “Make in India,” for overhauling the entire manufacturing landscape by encouraging multinational and domestic companies to manufacture their products in India. The main objective of the Make in India campaign is to facilitate investments into India by reducing barriers to doing business in India, fostering innovation, enhancing skill development, protecting intellectual property and building a best-in-class manufacturing infrastructure. With the Make in India initiative picking up pace and the opening up of the defense sector in India for manufacturing, several large companies have picked up the gauntlet and have made firm commitments for investment in India. Some of the significant investment announcements include contract manufacturing giant Foxconn deciding to invest U.S.$5 billion in factories and research development for the manufacturing of iPhones and iPads and General Motors’ investment of additional U.S.$1 billion to the manufacture of cars for domestic consumption and export. While most global manufacturing giants remain skeptical about India’s ability to implement the manufacturing reforms, the Make in India initiative, if implemented effectively, has the promise to transform India due to the large domestic markets, availability of resources and lower labor cost. Apart from the IT and manufacturing sectors, the other sectors that are likely to attract huge investments are infrastructure and banking, financial services and insurance. Based on these initiatives, it is expected that the Indian economy can achieve growth rate of 8-9 percent per year in the next three to four years. However, India has the history of underperforming to its true potential. It remains to be seen whether infrastructure constraints, high interest rates, indifferent bureaucracy and widespread corruption will play a detrimental role in India’s growth story or whether the focused reform measures shall overcome such challenges. India’s proposition as the next economic growth epicenter is critical in view of the global slowdown and continued uncertainty. If successful, India can be the shining star among its global peers and shift the global economic picture for decades to come.